I've visited Risdon Brook Park on numerous occasions over the Summer. One of my 'missions' has been to photograph the Yellow-rumped Thornbills, and in doing that I've spent much time watching both Yellow-rumped and their relatives, the Brown Thornbills and here are a few, somewhat random, thoughts. Both species belong to the same family, Acanthiza, look quite similar, but behave quite differently. Yellow rumps feed mostly on the ground, and the Browns mostly in shrubs and trees, sometimes in the outer foliage at considerable height. Despite that, their paths do occasionally cross, m ost often in wattles and scrub along the forest edges. In fact the accompanying photos were taken only a few metres apart. I believe the numbers of Yellow rumps have declined over the last twenty years, at least in the South of the state. 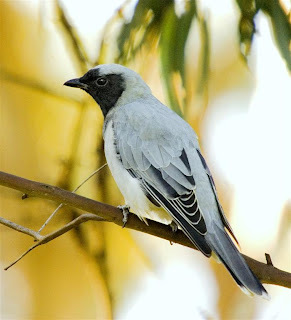 Bob Green, writing in his "Birds of Tasmania", describes them as "uncommon and sedentary". My impression is that although they appear sedentary during much of the Spring and Summer, for the rest of the year they appear to be nomadic. The Risdon Brook Park is one local area where they could be described as common, particularly among the grassland and decaying wattle scrub. Brown Thornbills frequently bathe, but I have yet to see the Yellow rumps do so, even when they have had the opportunity. Brown Thornbills build a domed nest close to the ground, and I have found most nests in low scrub and ferns, often after accidentally flushing the sitting bird. Yellow rumps nest in the lower branches of shrubs, such as acacias, often when they are in flower. I've often wondered whether the choice of yellow flowering shrubs to nest in was by design or chance. Yellow-throated Honeyeaters seem to do similarly. The Yellow rump's nest is something of an enigma. It's a hanging domed arrangement with the entrance near the base, but on top of the dome is a normal open "conventional" nest. It's often suggested that this is a ruse to confuse predators, which it may well do, but I suspect that there may be some other explanation as to why it's there. Browns are agile acrobats, frequently feeding while hanging upside down (as in the lower image), something I've rarely seen Yellowrumps do, they are more often encountered when flushed from grassland, when their yellow rumps make identification easy. By the way, I'm still trying to get good images of the Yellow rumps! 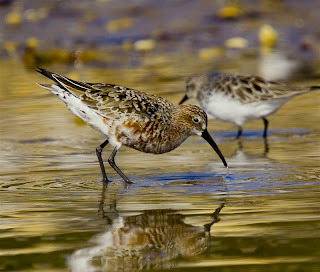 The few remaining Curlew Sandpiper will soon be departing for their breeding grounds in the high Arctic. Before they go, a few individuals will substantially acquire their spectacular breeding plumage, as shown in the images here. These shots were taken in Ralph's Bay near South Arm recently. 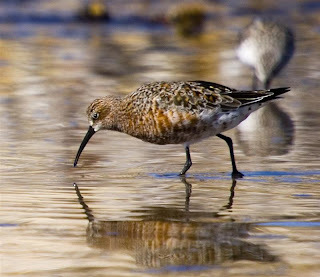 From my observations here in Southern Tasmania, most of our migratory waders depart in dribs and drabs, rather than in the large flocks one mentally associates with migrating birds. One possible explanation of this, is that they do their final 'bulking up' for the journey in such areas as the far NW of Tasmania or Southern Victoria. This return journey to the breeding grounds is achieved in a series of long hauls between what might be described as refuelling stops en route. It's quite possible that some birds will fly from Tasmania to Northern Western Australia or even further, non stop. To achieve this they will store fat by making a weight gain that is quite remarkable. Some years ago, my son Matthew and I, mist netted one particular Curlew Sand. only a stone's throw from where these photos were taken. Caught, if my memory serves me correctly, in early April, this bird weighed in at 100 grams. This compares with an average weight of around 65 grams, a weight gain of over 50%. I estimated the South Arm floc k of waders to be around the 1,000 mark. 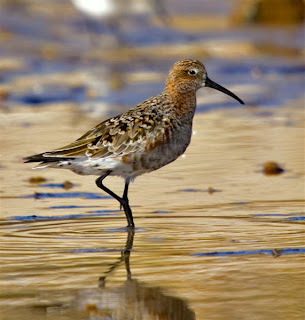 This was made up of about a dozen Curlew Sands., a small number of Double-banded and Red-capped Plover, and the rest Red-necked Stint. The latter, also soon to depart. If you want to see these birds in their finery, nows the time to do it. I had a good laugh at my own expense recently. I was visiting South Arm Neck and walking along the reserve at the western end, looking for the wader flock. I heard this guttural sound, somewhat reminiscient of a heron's call and not a call I was familiar with. Thinking this might be my lucky day, I started looking for the source. Well to stop this story reaching epic proportions, I'll tell you it turned out to be a sound emitted by a 40+cm. long, beached Arrow Squid! It was expelling air in a way that I assume would normally propel it forward when it's in water, and producing this odd sound. It turned out to be one of dozens washed up, many of which I returned to the sea, although as the tide was fast ebbing, I suspect this only prolonged their life by a few hours. Several hundred metres out in the bay, I could see a large flock of gulls, terns and cormorants in a great melee, chasing what I assumed was bait fish. However looking at some of the enlarged images, it appears more likely that the squid was the quarry, perhaps being chased by 'couta or some other predatory fish, as the cormorants only seemed to be eating strips of squid and the gulls certainly couldn't take a whole one. Later, back along the Neck, I watched the interactions, and strategies of birds as they vied for the spoils. Top of the heap were the Forest Ravens, more than capable of tearing up the squid, but as they could only feed on the squid on the beach, the Kelp Gulls would pull them back into the water. The prized bits were the head and tentacles, and I watched as one Kelp Gull wolfed down the entire head etc., in one piece, quite a feat, which changed it's silhouette considerably! Even pairs of Kelp Gulls argued over the free feed, as the image at the bottom shows. Both birds had pieces of the same squid, but what I believe is the male (on left), decided it preferred the bit the female had. By aggresive posturing, as you can see, it got it's own way, and they swapped pieces. Incidentally, the Silver Gulls were reduced to scavenging for left overs, seemingly unable to pull the squid apart by themselves. One More for My Peter Murrell Reserve List. Another brief visit to the Peter Murrell Reserve over the long weekend, allowed me to add one more species to my personal list of birds for this reserve. You won't get too excited over the species, a pair of Wood Duck. Nevertheless, although I must have seen many hundreds, these were the first here. As you can see from the male at right, it wasn't quite as pleased to see me! Depending how you view it, the growth in Wood Duck nunbers has been quite extraordinary.. There is a note in the 1973 Tasmanian Bird Report of a sighting of a pair with a clutch of young at Ross, with a note saying "this appears to be the first record of the species breeding in Tasmania". Nowadays, in some areas in the South, this is probably the most commonly found duck. I also saw several small groups of Forty-spotted Pardalotes, some of them engaging in vigorous chasing, possibly part of a pairing ritual. Amongst the same trees, a loose group of Yellow Wattlebirds were feeding in the outer branches, and also engaging in chasing. This time quite obviously the males chasing the females, there being a distinct size difference, with the males larger. As I walked down the Western boundary, I fell into conversation with a local, who, while not being a birder, had more than a passing knowledge of the local birds. I suspect he's one of a growing number of people who enjoy being able to ID their local birds, but have no desire to formalise this by joining birding organisations. He mentioned that he had seen a Grey Goshawk nearby recently, another species which I have yet to record in this reserve. As I neared the car park on my return, I noticed 2 Black-faced Cuckoo-shrikes hunting insects in the gums, and managed the accompanying shot. They have an interesting strategy. They patiently sit watching for movement among shrubs or the canopy, sometimes from below, other times from above. When they spot movement they quickly grab their prey. A very efficient method requiring minimal expenditure of energy! As I wandered back to my car, I did ponder why so many birds have black faces. It doesn't make photography any easier., but presumably there must be some advantage for the birds. I recently spent an hour or two, watching and photographing a Black-faced Cormorant fishing in the Lauderdale Canal. On many occasions I've watched them fishing off nearby bluffs and reefs in the Derwent River, but getting close enough to photograph or observ e them in detail, is usually difficult. I have only noted one 'Black-face' fishing in the canal, but I've no real way of knowing whether it's always the same individual. I took many shots and found it difficult to know what to publish, so I've chosen a few that perhaps show some of the observations I made. As you can see in top left image of the submerged bird, in places this waterway is very shallow and in that regard, is not typical of this species preferred fishing haunts. In the main, presumably because the water's so shallow, it searched for prey by putting only its head underwater, and on locating the prey would usually dive. It could achieve an amazing burst of speed over a short distance. Difficult to quantify, but seemingly faste r than brisk walking pace. Most of the smaller prey appeared to be partially swallowed before it resurfaced, as I only occasionally saw the prey, small fish. One of the images shows (on close examination), the bird expelling water, something I hadn't previously noted, but on reflection, it would take in quite large quantities catching prey that would have to be expelled! At other times, it would cruise around with just its head showing, and in still water, this appeared to be sufficient for it to find prey. One of the shots at the bottom of the page, shows what I can only describe as the bird having a bath, in which the bird splashes madly about, p rior to wading ashore t o dry out. Perhaps this action, which is somewhat akin to land birds ruffling their feathers, helps reposition feathers. How bedraggled cormorants get, can be seen in the shot of it wading ashore. For me, the few hours spent with this particular bird, was a fascinating insight into a small slice of this species habits. NB This "canal" is more akin to a long narrow tidal inlet. I dropped by Orielton Lagoon recently, on the way home from visiting friends. As always, I was armed with a camera, just in case. I scanned the shoreline from around Cemetery Point, noting that there were groups of waders close to the Causeway, and 'the' Royal Spoonbill on Suzie Islet, which seems to be its' prefered roosting site these days, together with several Pelicans. I wandered towards the waders. They turned out to be Red-necked Stint, Golden Plover, and a single Greenshank and I hoped they'd stay put to give me a chance to get a shot or two. They didn't. As I turned back, I noted a Swamp Harrier, still a kilometre away, but coming towards me as it quartered the edge of the lagoon. Time to get myself organised for a photo opportunity! I didn't give myself much of a chance, because over much of the Summer I had similarly prepared myself, but in all cases, to no avail. The harrier was briefly divebombed by 2 of a large flock of Masked Lapwing. Perhaps they were late breeders still having youngish offspring, or perhaps they just couldn't help themselves. 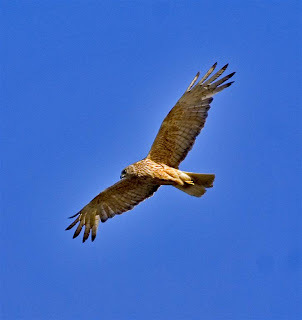 They returned to the flock, and the harrier continued towards me, and I shot off the accompanying images. 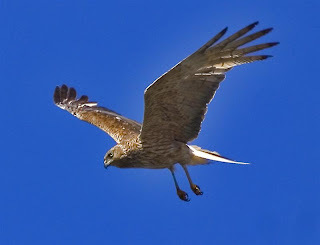 But just as I thought my luck had finally changed, something spooked the harrier and it rapidly climbed and moved away. At first I guessed that I may have been the culprit, but as I looked forlornly at the fast disappearing harrier, I became aware of a sound that I'd heard here on a previous occasion...a radio-controlled model aircraft. Not the usual 2 stroke sound that I'd always associated with model aircraft, but a relatively quieter, but insistent, buzz of a gas powered model aircraft (shown at left). Flown from a nearby paddock, on some of its' orbits it just impinged over the lagoon. Of course, I've no way of knowing for sure whether this was indeed what spooked the harrier, but I did notice that there were no birds to be seen along the shoreline opposite the orbiting model. One model flown occasionally, will probably not impact on the area significantly, but it is something worth keeping an eye on. As I mentioned in my article on the Whimbrel, I had the opportunity to photograph both Crested and Caspian Terns at the Marion Bay Spit. So here are a few of the images I shot there of one of my favourites, the Caspian Tern. This adult 'Caspian' (I only saw the one adult with this youngster), was very protective of its' sole progeny. It saw off an adult Kelp Gull that wandered a little too close for its' liking, then put on a threat display, with wings held high, as other gulls flew over. Finally it flew, calling noisily (top left shot), and for a while I wondered what was the object of this display. The penny finally dropped.... it was me! I had crossed that imaginary boundary, and had ventured just too close. The Caspian Tern is mainly a Summer visitor to Tasmania and breeds mostly on offshore islands. It's quite likely that this bird had bred on nearby Visscher Island. It's the World's largest tern, and some idea of size may be gained from the shot of it with a Silver Gull. It has a similar wingspan to the Pacific and Kelp Gulls. It's found quite widely around the World, and I have also seen it in the Middle East, Europe and North America. If you wish to more fully enjoy these magnificent birds, (other than going and looking for yourself) , I suggest you click on the shots to enlarge them.I hope in some small way, you can see why they're one of my favourites. Ian May of St Helens has reported the sighting of a Dollarbird at Upper Scamander, on the East Coast. The Dollarbird is an 'accidental' visitor to this state. First recorded from the West Coast at Crotty in 1918, and again from King Island in 1985. If anyone is interested, they might access the birding-aus forum as there are detailed directions given on the locality it was seen. Monday 12th March. Ian has just sent the accompanying digiscoped image of the Dollarbird at Scamander. He asks if anyone has been there to view it as it appears to be remaining in the area. Despite a less than favourable forecast "showers and a top temperature of only 16C", I opted for a visit to Marion Bay. It proved to be a good decision, but only just. I walked to the end of the spit and was hopeful of finding a range of waders. On arrival I found only gulls and terns. I shouldn't really have said only, because at this time of year they are exhibiting an interesting range of plumages. I photographed adult and juvenile Crested and Caspian Terns and Kelp and Pacific Gulls in a variety of plumages too. But apart from a flock of Pied Oystercatchers, no waders. A little disappointed, I turned for home. As I did so I caught sight of a flock of 22 Bar-tailed Godwit flying low over the bay. Well I've photographed them here on several occasions, so I didn't get too excited, but I quickly moved away from the shore in the hope they would land. They did. While watching them I realised that there was a lone Whimbrel amongst them. It's a species I haven't previously recorded out at the spit, although I have seen them in other parts of the bay, usually on rocky shores. They are a bit thin on the ground this far South, but do regularly occur in small numbers in the Tamar River (in Northern Tasmania). I think they could reasonably be described as uncommon, and I hadn't previously managed to get anywhere remotely close enough to photograph them. I knew from previous visits that with care I can usually get fairly close to the Bartails. The only issue was that with a stiff NW'ly breeze blowing, and the birds prefering to face into it, and the sun from the SE, didn't make photography easy. Oh well, can't expect everything to be right! I approached the flock with some care. They were a little flighty, mainly because of the presence of the larger gulls, but seem to tolerate my fairly close approach and then I went to town! Couldn't help taking 'just one more' shot, but I did manage to restrain myself and only publish 3. The top image gives a fair indication of the ralative size of the 2 species. It's also interesting to note that the barring on the Whimbrel covers almost its' entire body, something I was unaware of. I had considered writing a humurous caption for the middle shot, something on the lines of the Bartails mentioning that the Whimbrel appeared to have a 'droop' problem, but decided against it!! A great morning, and it did rain, just as I was backing down my drive. I for one, rather take the White-fronted Chat for granted. They're common enough in suitable habitat, and because of that perhaps we don't give them a second look. At the moment, after considerable rain here in SE Tas. over the last few weeks, they are particularly abundant in some areas. That does raise a question in my mind, exactly where do they all disappear to in the drier times? It does suggest that they may be nomadic, something I hadn't considered before. Prior to the recent rain, there seemed to be surprisingly few in local marshes, apart from an odd pair or family group. But in the last week, in the self same coastal marshes, they've been in their tens, or, as happened at Pipeclay Lagoon recently, they numbered in their hundreds. One of the things that I've noticed as a result of photographing them on several occasions, is the variation in eye colour. In the two images here, the adult male at the top has a pink eye, whereas the juvenile female at bottom, has a red eye (you may need to click on the image to enlarge it to pick up the colour). The difference is presumably age related, with the eye becoming lighter with age. The White-fronted Chat is the only chat present in Tasmania, but may be found from sea level to the Central Plateau. It seems only a matter of a few weeks ago, after one of the longest dry periods in Tasmania I can remember, that I made a pact with myself that I wouldn't complain about it raining ever again. But after more than a week of rain and drizzle, I'm having second thoughts! I've endured a garden inches deep in water, thanks to a nearby overflowing storm drain, and drizzle for the next week, enough's enough! If your wondering what the shot of a Black Swan is doing here, well it's one of several waterfowl images missing from the archive of Tasmanian birds (accessed by clicking the "Tasmanian Species List link down the right hand side), and seemed somewhat appropriate given the weather conditions. Black Swan nest just about the whole year round here, providing the conditions are suitable. This one was photographed at Lake Dulverton, Oatlands, in May of last year. I've seen them with young in the middle of Winter even in the Highlands. Going back to the late 60's, there was a 2 day shooting season, but I seem to remember that public pressure eventually halted that. On the East Coast of Tasmania I do recall they were illegally shot, and locally, when talking about them, they were referred to as "Glamorgan Geese", named after the local shire . 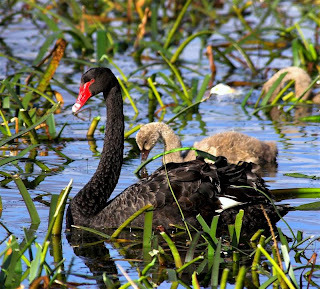 In the early days of settlement, they were often taken for the table, and the first bird protection act passed, in what was then Van Diemen's Land, gave the Black Swan limited protection.